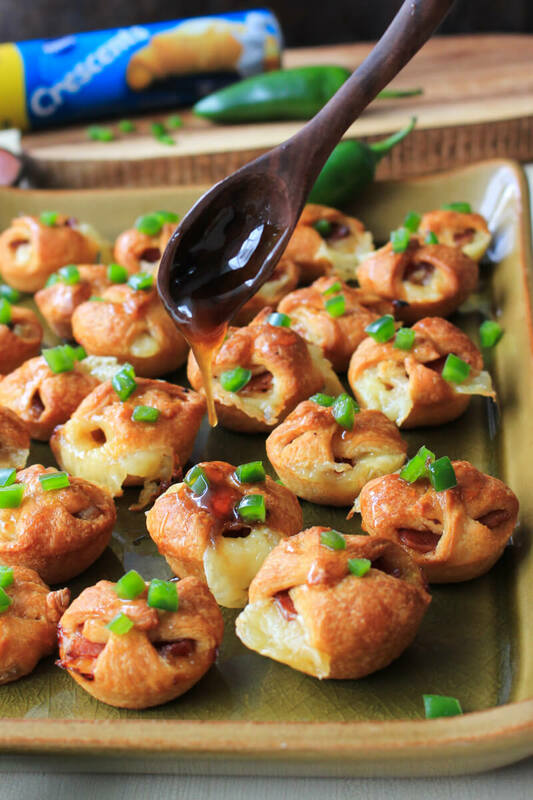 Brie, Bacon, and Apricot Jam Crescent Bites made with Pillsbury Crescent Rolls are the perfect little-bite appetizer to share with friends and family at your next holiday celebration or party. When I come across an appetizer recipe that catches my eye, my mind automatically goes to my family and if they will like it or not. Family is almost always at the heart of our reason for partying! Whether we're celebrating a birthday, holiday, shower or graduation, when I am serving appetizers, I am usually sharing them with the ones I love the most. That's probably the reason why I love appetizers so much! Appetizers mean party time, and party time means family time. Sometimes we will host get-togethers at our house, and sometimes we'll head to the home of one of our family members, but one thing is for sure when we celebrate, we are always serving up by lots of made-at-home food! My husband and I have three sisters each, so there is always a celebration on the horizon, complete with a guest list full of brothers, sisters, aunts, uncles, cousins, parents, and grandparents. I'm always on the lookout for party-perfect recipes that will keep everyone coming back for more when we all get together. 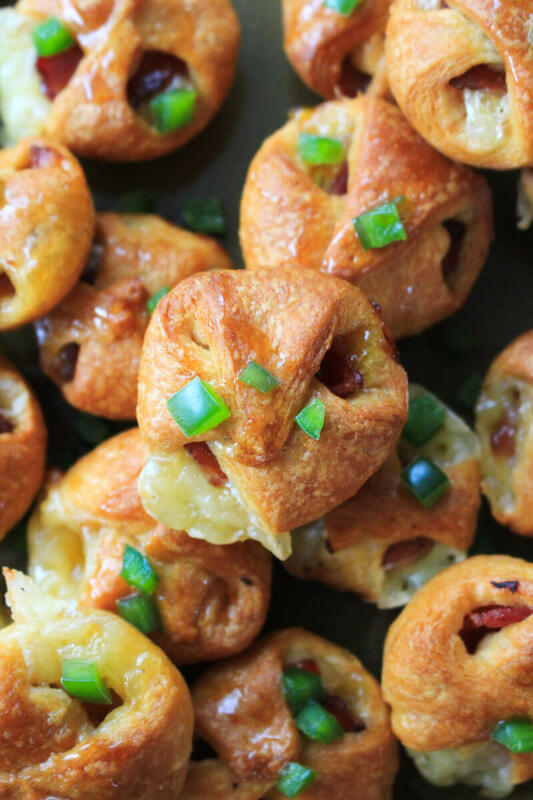 This Brie, Bacon, and Apricot Jam Crescent Bites appetizer recipe is one that I know will make my family swoon because it's a new take on an old family favorite. My sister-in-law is famous for her baked Brie topped with apricot jam and fresh minced jalapeño that has been served at countless family gatherings and holiday celebrations over the years. We've enjoyed it before Christmas dinner, on Grandma's birthday, and even during summertime barbecues. Everyone in the family loves it and looks forward to it! My sister-in-law's Brie recipe is the kind of recipe that makes me do a little happy dance in my head when I walk into a party and see it sitting on the table. I just love all the familiar flavors and family memories that go along with it. Those are the best kind of recipes, don't you think? 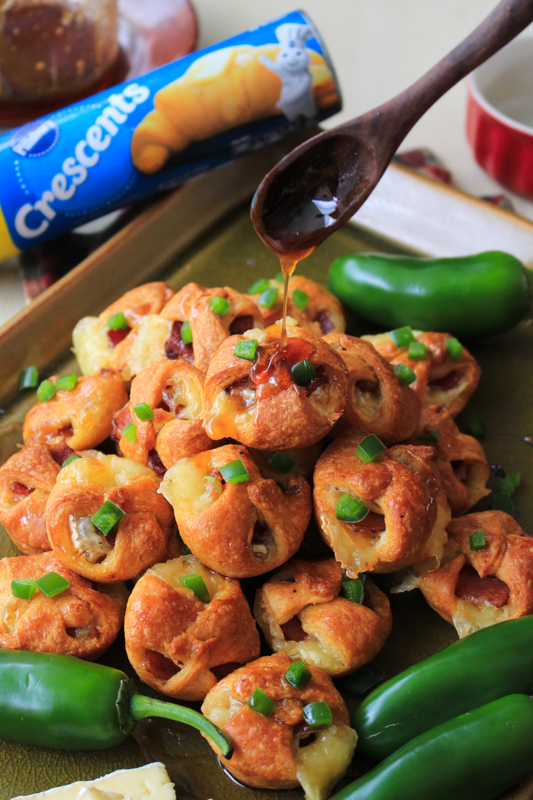 I wanted to put my own twist on our family's favorite Brie appetizer using Pillsbury crescent rolls for the 48th Pillsbury Bake-Off® Contest. That's right, America’s original cooking competition is back! This year marks the 48th anniversary of the Pillsbury Bake-Off® Contest and to celebrate, Pillsbury is partnering with Food Network to share beautiful memories over delicious food featuring all of your favorite Pillsbury doughs. Which category speaks to you? Because appetizers are my jam, I wanted to create a recipe for the Appetizers for Any Party theme. My Crescent Bites are sweet, salty, and a little spicy, which is basically the perfect bite. The creamy Brie, the sweet jam, and the fresh jalapeño peppers are just like my sister-in-law's recipe, but I brought in smoky bacon and soft, golden, Butter Flake crescent rolls to the mix. 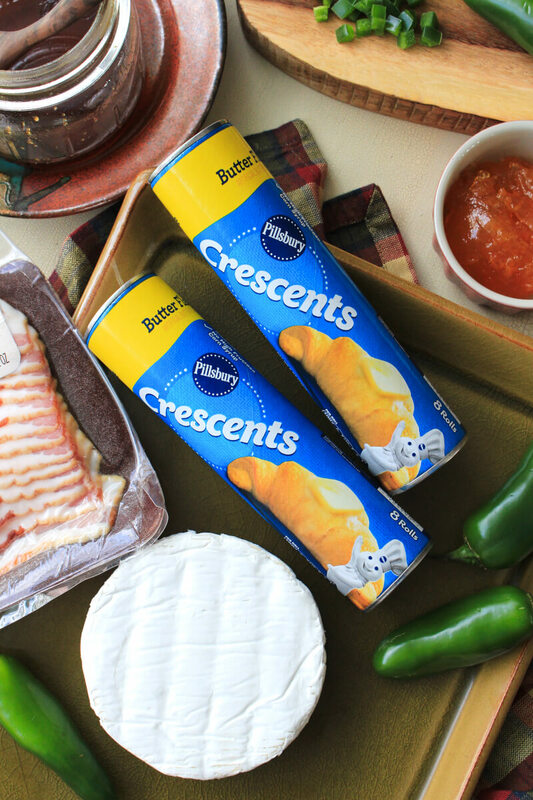 Pillsbury crescent rolls are always a crowd pleaser when I incorporate them into our favorite dishes and we loooove bacon, so I knew this recipe would be a winner! This Brie, Bacon, and Apricot Jam Crescent Bites recipe really speaks to me, though, because the flavors are inspired by a family favorite recipe. But, more importantly, because it honors the important things in life: memories and traditions made at home with family! Epic! If that doesn't inspire you to enter, I don't know what will! You can get all of the contest details by checking out the Official Contest Rules. Follow one or follow them all! Instagram is a personal favorite of mine. So, now the question of the day is, what dish brings your family together? Do you love sharing Sunday mornings together over breakfast casseroles and coffee? Does your family have that one special dinner recipe no one can get enough of? Is the key to your family's heart found in a dessert? 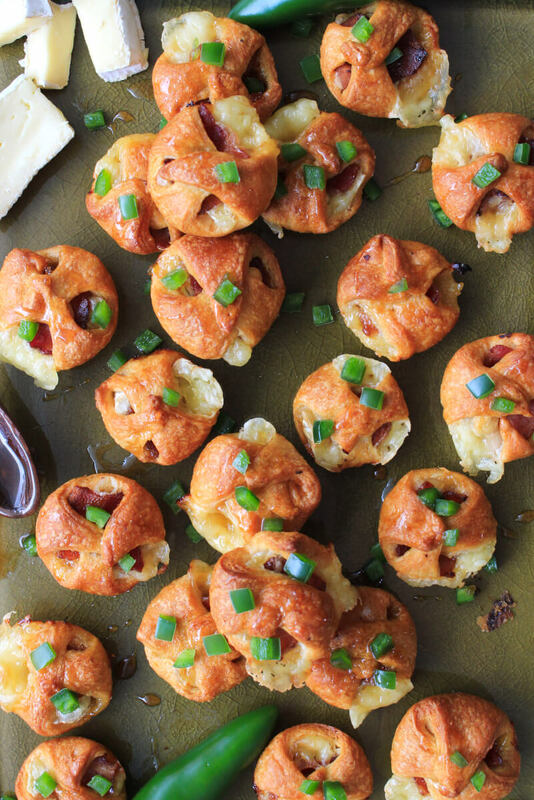 Maybe you're like me and appetizers are the center of your favorite family memories. Share own original recipe and the story, tradition, and memory behind it in this year's Pillsbury Bake-off® Contest! I can't wait to hear your story and see the winning recipes! 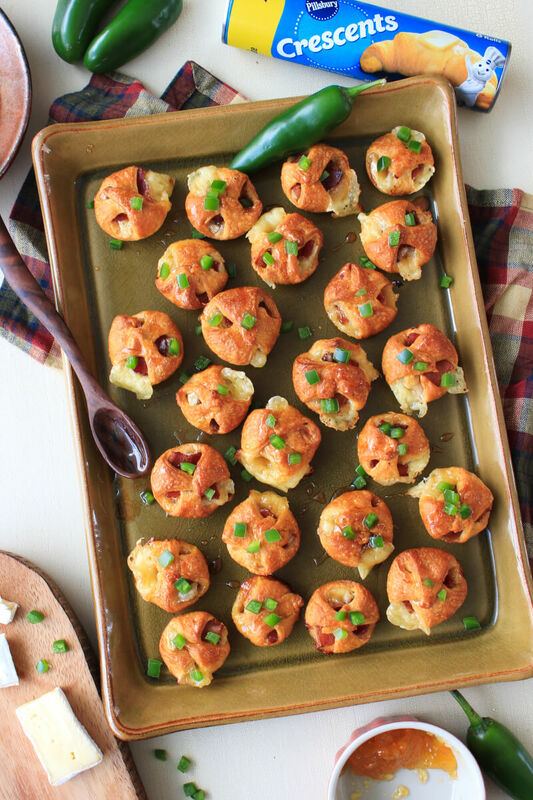 Brie, Bacon, and Apricot Jam Crescent Bites are the perfect little bite appetizer to share with friends and family at your next holiday celebration or party. They are sweet, salty, and spicy all wrapped in golden Pillsbury crescent rolls. 1. Heat oven to 375°F. Spray a 24-cup mini muffin tin with cooking spray. 2. 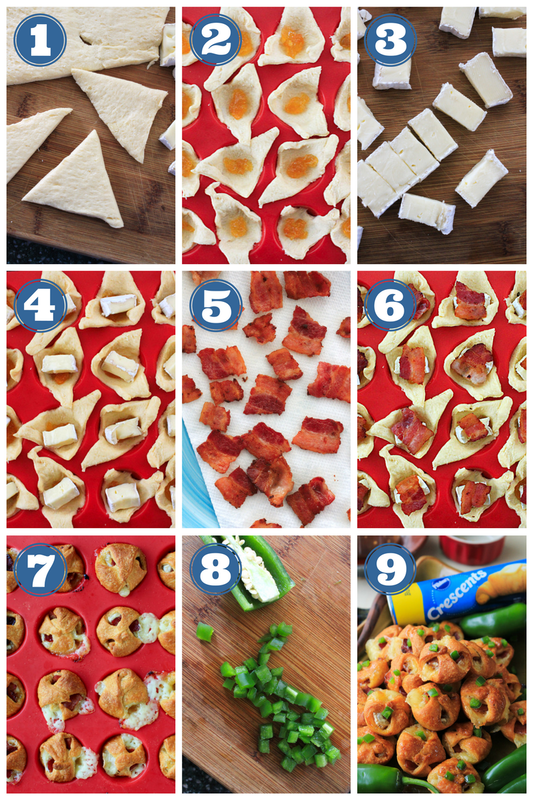 Unroll dough and separate into 8 triangles; cut each triangle into 3 pieces making 24 small triangles. Place one piece of crescent dough into each muffin cup. 3. Fill each cup with 1/2 teaspoon of the apricot preserves, a cube of Brie cheese, and a piece of bacon. Fold the corners of the dough over the top of the muffin cup. 4. Bake 17 to 20 minutes or until golden brown. 5. Transfer to a serving platter, drizzle with honey, and top with minced jalapeño. Serve warm.